I've seen and heard people talking about sloppy joes for years. I've always planned to make them, but I never got around to it. I was stuck in that eternal loop. Don't those look good? I have to try them! Then nothing. I know, I know I should just get on with it. They were easy to make and so tasty! It was such a treat. I toasted my rolls and spread them generously with cream cheese (Violife of course darling! ), filled them with lots of the savoury mince and topped it with some dairy-free cheddar. Mmmmmm! Of course if you are vegetarian feel free to use standard cream cheese and cheddar. I use veggie mince a lot. Probably because I became veggie over 25 years ago and back then there weren't many options. 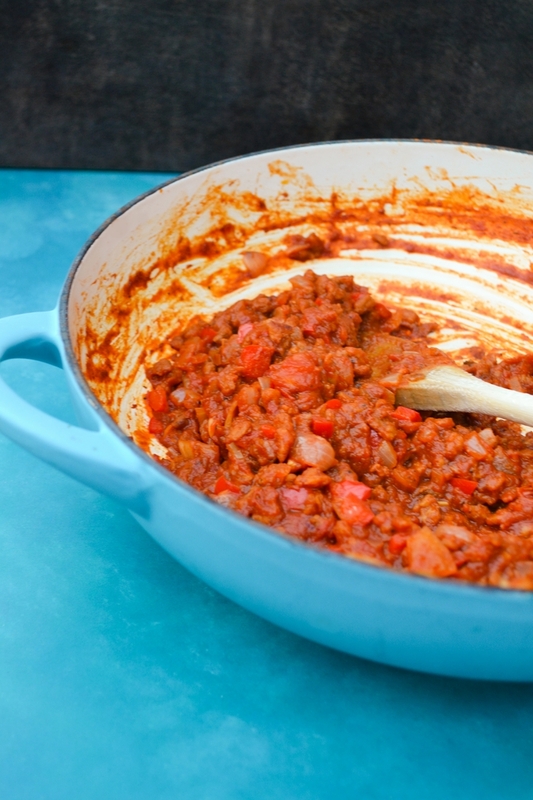 I fell in love with it when my mother-in-law made me her veggie bolognaise and started using it myself to make shepherd's pie, cottage pie, chilli and of course her fabulous bolognaise. Funnily enough I'm not keen on things pretending to be meat. I do eat vegan sausages and veggie mince, but don't expect me to go near anything described as veggie chicken, fish or deli slices. Ugh! 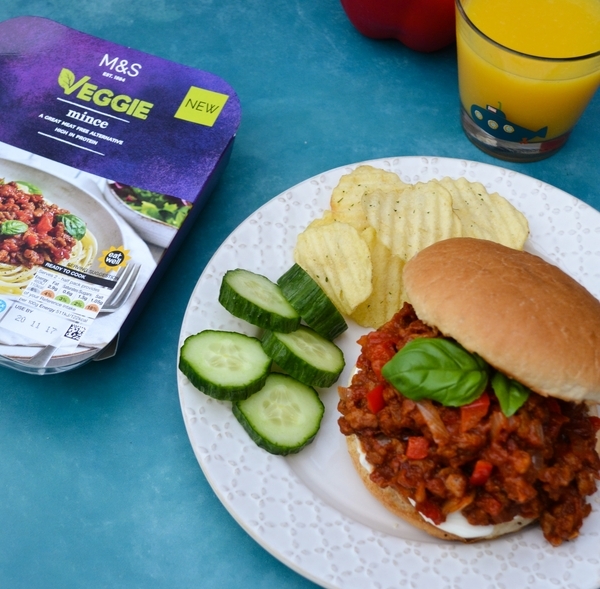 The veggie mince I used is part of a new vegetarian range from M&S called Veggie. It's vegan, high in protein, low in calories and gluten free. YEE HAW! 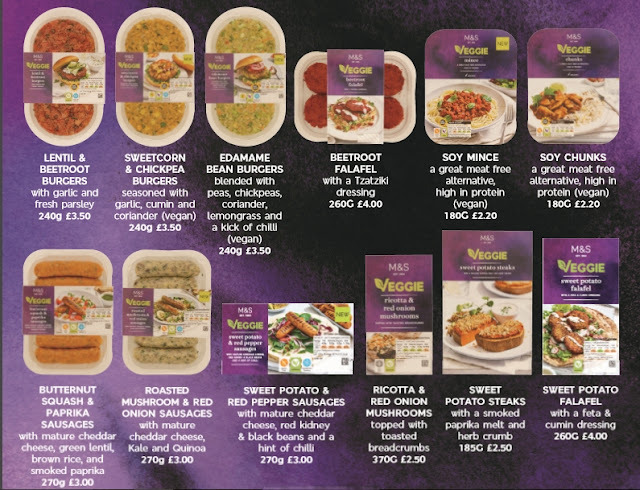 M&S are selling a great new selection of veggie and vegan dishes including edamame bean burgers, beetroot falafel and sweet potato sausages. I found them in the prepared vegetable chilled section rather than the vegetarian section, but that could change from store to store. Have a look in the prepared veg section first. You'll notice there is a few vegan options which is great. 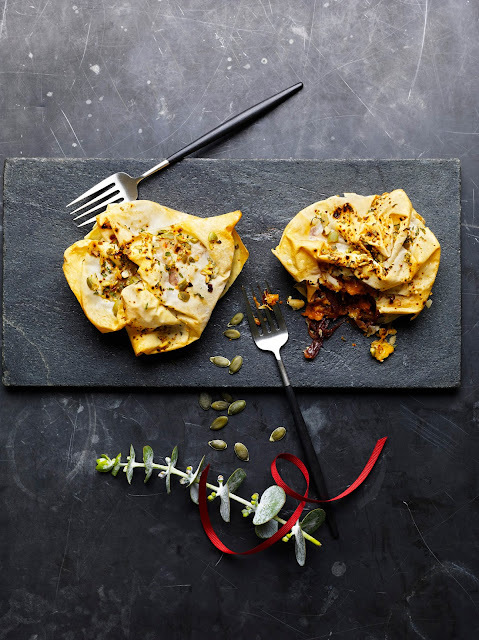 M&S have some nice veggie food for Christmas this year too. Add a selection of vegetables and gravy and you're in for one tasty Christmas! A wee tip from me when you are in M&S, ask a member of staff to check your Sparks Card. They have a wee hand held machine now. They can check your offers and activate them for you. I got a great discount on my fruit and veg last time I was in. It's worth doing. I also got a good discount on clothes for Cooper and got him some nice Christmas jammies (PJs) & cosy jammie case. Shhh! Don't tell him! I hope you try my sloppy joes and let me know what you think. I loved them and hope you do to. From my home to yours! 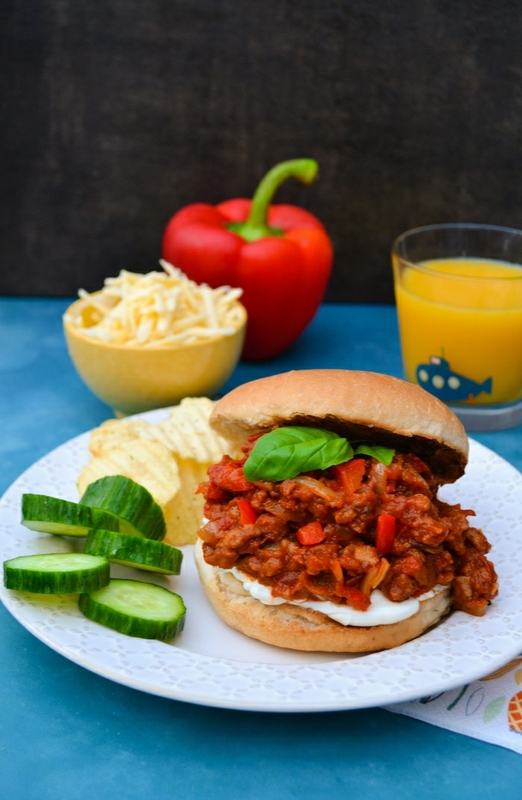 An easy recipe for vegan sloppy joes studded with red pepper and spiced up with paprika and cumin. Serve on a toasted bun with cream cheese and grated cheddar (vegan or veggie, it's up to you). In a large pan or frying pan, saute the onion and garlic in the olive oil until soft. Add the chopped red pepper and cook gently for a few more minutes. Add the veggie mince and spices and stir to combine. Add the rest of the ingredients, mix well and cook on a medium heat for 15 to 20 minutes until the savoury mince is thick and delicious! Serve on a toasted bun naked or with your favourite toppings. If you can't get hold of chilled veggie mince you can use dried or frozen soya mince. The dried will need more stock. If you love food in buns like these sloppy joes, check out my ultimate sandwich guide. Disclosure: I created this recipe to highlight the new veggie range from M&S. I was not expected to write a positive review and any opinions expressed are my own. Looks like an awesome veggie mince! I could mop it straight out of the pan with some crusty bread! What a great idea for a Sloppy Joe. Haha yes that would be good too! Finally a vegan sloppy joe! I will be adding this to our menu. Yay! Let me know what you think once you've tried them. We loved them! Ah, this looks lovely, I don't think I'd miss the meat at all! My work is done. Actually I just try to make veggie food that everyone can and enjoy. This looks delicious! 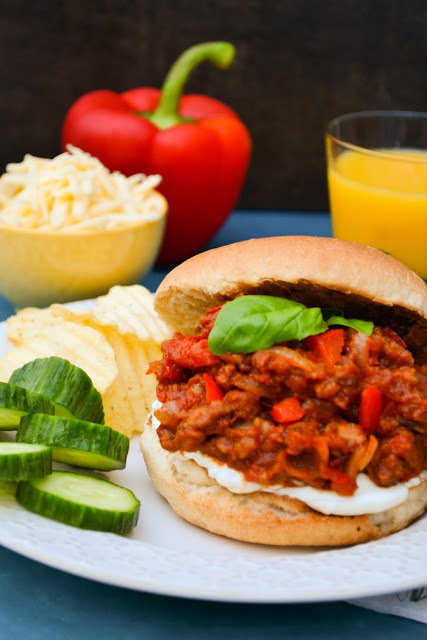 I love the vegetarian spin on sloppy joes -- I am not vegetarian but I think I would prefer this to the original! I hope you try it Michelle, it's so tasty! That's such good news about the M&S range, it might make things a bit easier for my MIL when we're staying with her next month - she does tend to get a bit stressed about making sure we have enough protein! Now, how do I persuade her that those edamame burgers are a totally legit thing to have for dinner? Heheh! I've not heard of pav bhaji. They weren't actually too sloppy which I am truly glad about. Enjoy these and the new M&S range. I haven't had sloppy joe's since I was a kid! So great to have a vegan version! New to your blog and TOTALLY LOVING IT! I hope you don't mind that I linked you! I hope to stop by more often and comment more frequently! Jennifer @ http://MyBlissfulJourney.com CHEERS! Thanks for stopping by Jennifer and for linking to me. I will pop over and visit soon. And yes you will notice a difference next time you come over to visit, there is so much more choice now. It's fabulous. Oh those look so good! I'm with you on having intended to make Sloppy Joes for ages but never got around to it, but I will now! Good on M&S for all these lovely vegan and veggie products, they look really good, will keep an eye out for them next time I'm there. Do try them Kate, they are great and yes I am really pleased about the new range too. This sounds delicious. I want to organize a more plant-based diet for me and my family. This will be a great step in that direction.